Ryan is an independent artist from Sylvania, Ohio, a proud member of the United States Air Force and a student at the University of Toledo studying Special Ed. 4Keeps Animal Rescue is now a PetSmart Adoption Partner! Thanks to PetSmart for welcoming us! 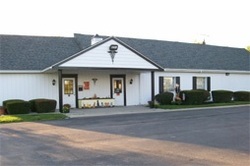 Ash Veterinary Clinic is a full-service veterinary medical facility, located in Carleton, MI. The professional and courteous staff at Ash Veterinary Clinic seeks to provide the best possible medical care, surgical care and dental care for their highly-valued patients. At Healthy Paws Veterinary Hospital & Housecalls it is our goal to provide personalized quality medical and surgical care to our furry, four-legged patients. We strive to offer the best possible service to our clients and their pets, and to do so in a warm and caring environment. That’s why we go out of our way to ensure immediate, quality care is available when you need it. From basic check-ups to surgery, our staff offers personalized, friendly service every time. See how you can help! !